The natural way to control weeds is to build the soil by increasing the organic matter and most weeds won’t be a problem. In the interim, hand pull problem weeds, spot spray with vinegar-based herbicides and apply corn gluten meal at 20 lbs./1,000 sq. feet spring and fall prior to seed germination. For winter weeds, spray between Christmas and New Years with vinegar. The best mixture is full strength 10% pickling vinegar into which is mixed 2 oz. orange oil and 1 teaspoon liquid soap per gallon of vinegar. This technique works fairly well any time during the winter when the summer grasses are dormant. Weeds can be controlled with non-toxic products. Forget using black plastic, toxic chemical herbicides, salt and bleach. Remember one of our primary rules – do nothing to harm the life in the soil. Bleach and toxic chemical herbicides are poor choices, but there are some good ones. To keep the weeds out of a decorative or utility gravel area, the best approach is to design them out from the beginning or use organic products later to kill the weeds. Salt, toxic herbicides and bleach should never be used because they contaminate the soil long term. They also leach into the water stream. To head off the problem, install the gravel in a thick layer – 6-8” after scraping away all grasses and weeds. For additional control, add a layer of white caliche rock before putting the gravel on top. Any weeds that grow through the gravel can be sprayed and killed with a mix of 10% pickling vinegar mixed with 2 ounces orange oil and 1 teaspoon liquid soap. Weeds in beds can be killed by removing the tops and then covering the problem area with 1/2" of compost followed about 5 layers of newspaper. Wet it all down and cover the paper with 2-4" of shredded mulch. Spot spray any weeds that manage to come through with the vinegar herbicide or commercial organic herbicides. 1. Corn Gluten Meal - It is a natural weed and feed fertilizer. It should be broadcast to prevent grassburs, crabgrass, and other annual weeds that germinate from seed. The key is to broadcast the material before the weed seed germinate. Possibly its best use is around root crops, bulb plants like onions and other transplants. CGM on the bare soil around the young plants feeds to help develop big healthy plants while keeping the competing weeds at bay. CGM can also be used with this method in seed planting but only after the seeds have grown into small seedlings. 4. Flame Weeders – Red Dragon is the specific brand I have tried and it works on many tough to control weeds. There are small lightweight models for the homeowner and large commercial selections as well. They run off propane gas. Of course, be careful using any fire producing device. 6. Vinegar - The best choice for herbicide use is 10% white vinegar made from grain alcohol. It should be used full strength. I've mentioned 20% in the past, but it is stronger than needed and too expensive. There is one exception. 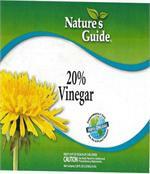 Nature’s Guide now has a 20% vinegar legally registered for weed control. 7. Hand Tools – Hand weeding is still legal and recommended – and it doesn’t take that much time if done a little at a time on a regular basis. Regular hoes, stirrup hoes, weed “poppers” and “twisters” are among the choices. Vinegar sprayed on the bases of trees and other woody plants will not hurt the plant at all. This technique was first learned about by spraying the suckers and weeds growing around the bases of grapevines. Use only natural vinegars and avoid all vinegar products made from glacial acetic acid.